Najam Sethi was literally “silenced” when he discussed the ISI. It should be noted that Sethi was not blaming or accusing ISI. He was merely talking about the agency. However even that was considered too dangerous. It is unlikely that this censorship was done by ISI or any other national agency. Probably Geo News chose to self-censor – but that’s actually the point, isn’t it? Geo suffered a major smear campaign after airing accusations that ISI was involved in the attempted killing of Hamid Mir. After tendering a public apology to ISI, Jang group began publishing a string of ridiculously strong pieces praising Army chief Gen Raheel. Following Sabeen’s assassination, the media group was not going to make the same mistake again. Geo isn’t the only media group to self-censor reporting about sensitive military institutions. Last year, Express Tribune told employees that they would no longer accept any opinion piece or cartoon on military or military operations. This was originally viewed as a response to terrorist attacks, but recent events indicate there is more too it. Earlier today, Express Tribune published a piece originally from Reuters that quoted military officials telling that ISI chief Rizwan Akhtar is carrying out a “quiet, creeping takeover of Karachi by the military”. 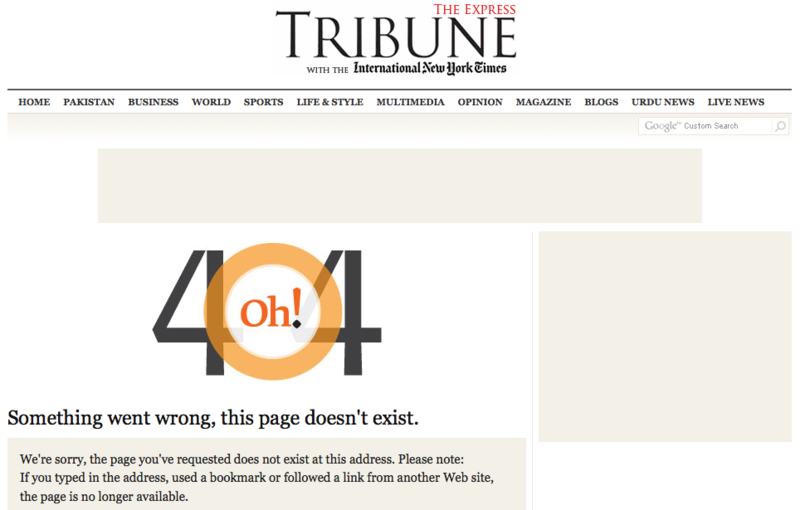 The report was quickly deleted from Express Tribune’s website. This is how terrorism works. There only need to be so many Saleem Shahzads, Umar Cheemas, and Hamid Mirs before the message is received loud and clear. After that, you don’t need to see the gun to know it’s there, and nobody has to censor you because you are more than willing to do it yourself. This entry was posted in Blogs and tagged #BanGeo, censorship, Express Tribune, Hamid Mir, isi, Jang Group, media, Najam Sethi, Rizwan Akhtar, Saleem Shahzad, state terrorism, umar cheema by Omar Derawal. Bookmark the permalink.